Once again, as with the other recent demonstrations in solidarity with the Palestinians, the media has failed in reporting the numbers accurately. 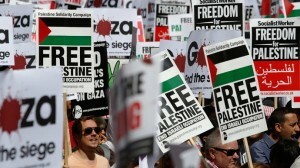 Interestingly, a piece in the Guardian which at least covered what must have been one of the largest public displays of support for Gaza, and opposition to the state of Israel since millions marched against the illegal war waged on Iraq in 2003, noted that “According to police, more than 20,000 people marched”. Which technically is true. More than 20,000 people did march, but by all accounts the true figure was more likely closer to 150,000. But of course, rather than acknowledge the level of support and sympathy that is growing for the Palestinians, in part due to the fact that social media circulating the stories which fail to reach the public’s eyes and ears, most in the media would rather willfully bury their heads in the sand. It might be the case that of late that institutions and platforms like the BBC have been forced to alter, ever so slightly their coverage of the so-called Israeli Palestinian conflict, to actually reflect something closer to the truth, and some real Palestinian voices, but this is only because of a huge level of public outcry. The demonstrations outside the BBC’s offices must have deafened the chief execs. Such is the nature of power. They have not shifted their tone, albeit by just a millimeter because of some kind of moral epiphany. It is because it is becoming more and more apparent that the siege on the media, plays a direct role in shaping public opinion, which directly fuels the disinformation, which is key in legitimizing the illegality of the occupation in people’s minds. Clearly public protests and other forms of resistance can and do have an impact. If nothing else, large numbers of people hitting the streets (if reported) at the very least puts the issue firmly on the map. 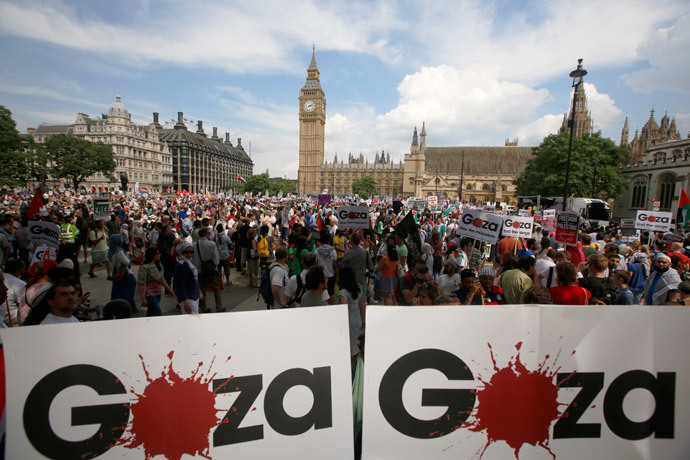 And it was not just in London where people took to the streets to show their disgust at the actions of the Israeli government, and IDF extremists. Could the tide be turning? 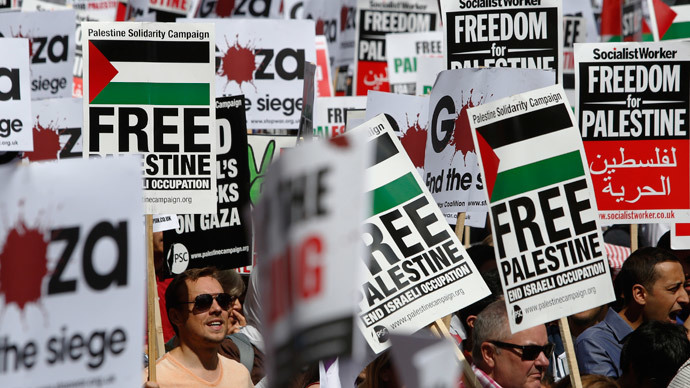 If the media begins to change is tune, then perhaps this underpins the fact that public support now overwhelmingly identifies with the plight of the Palestinians, even if the media does not wholly reflect it. A good example of the need some feel, to nonetheless cling to the stale propaganda which the continued oppression of the Palestinians depends on, can be seen here. Ali Abunimah, founder of the website Electronic intifada debates a commentator renowned for his pro-Israeli bias, and eloquently destroys each of the propagandistic talking points which Zionist supporters love to cling to, articulated here by J.J Goldberg. Goldberg repeats the same talking points you’ll always here the defenders of Israel’s terrorism cling to, despite the fact that Palestinians are facing annihilation. Abunimah very clearly, dismantles each of them. Baroness Sayeeda Warsi stepped down as a government minister from the coalition government, stating that she found the government’s position on Gaza to be “morally indefensible”. 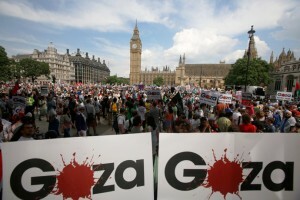 There is another worrying direction though, that public debate is veering to regarding the bombardment of Gaza. First are discussions about the rise of anti-Semitism. As we have seen a rise in Islamophobia throughout Europe, reports over the last few days have showed an equally worrying spike in racist attacks on Jewish communities throughout Europe. Any reasonable person would thoroughly reject any form of racism, including rejected directed at Jewish communities. This goes without saying. But we must be equally vigilant in dealing with Islamophobia which unfortunately in the Western media, directly feeds into the justifications for the treatment of Palestinians. People think the Palestinians are terrorists, largely because Hamas the elected government of Palestine are presented as such. I will say that again. Hamas are the elected government of Palestine, who receive no funding from the US, nor do they have any diplomatic support, unlike the IDF extremists, who have killed hundreds of civilians in their latest and periodical assault on Gaza. This leads to my final point. I have done a few radio appearances in recent days including one on LBC. It is interesting to me, that despite the fact that literally hundreds of innocent Palestinians have been butchered, many of the questions I faced were about the rise in anti-Semitism, and also the legitimacy of Hamas as elected representatives of the besieged Palestinian people. It is a surreal world, when Westerners whose taxes fund the oppression in Palestine, think that the Palestinians (And people like me who try to highlight the injustice they face), in the face of unimaginable suffering, and unimaginable war crimes, somehow have to answer for the leadership they have chosen. We only have to imagine how the world would react to hundreds of innocent Israelis being killed on beaches, synagogues and in hospitals as is happening to the Palestinians, to understand just how much the media and political establishment favor the terror state of Israel. The world would not stand for it, but they stand for this, because whether they realize it or not, many people believe that Palestinian lives are not worth anything, that they are terrorists, despite the fact that they are the victims of terrorism. The Palestinians are being murdered by one of the most sophisticated armed forces in the world, and all the compliant media can do is bleat on about Israel’s right to defend itself. The dynamics of this so-called conflict are really very simple. Israel are terrorists and the IDF are extremist militants carrying out the actions of a murderous state. The victims of this terrorism are the Palestinians. Hamas are the government of the Palestinians. This is not conjecture, this is fact, acknowledged by International law and every human rights organization which is respected. The media has for so long favored those enforcing the apartheid state, but the tide will turn. It is a sick world when the victims of terrorism are called terrorists and the ones carrying out the terrorism are presented as democrats. It is even more unbelievable that people believe the lies they are fed, in the face of undeniable evidence that Israel simple wants to rid the hold land of every single Palestinian. What is happening in Gaza is systematic ethnic cleansing. The world needs to wake up and stop entertaining this silly notion of Israel’s right to defend itself when plainly and simply Israel is trying to erase the Palestinians from the history books.